What are Effects of Anxiety on Your Health? Anxiety means (excessive) worrying about something for which the outcome is uncertain. Anxiety can also be termed as nervousness or stress. Anxiety is a state where one experiences lack of sense of well-being, for a short or prolonged period. Prolonged anxiety can induce, aggravate or contribute to maintain many diseases. Human being is a social animal. With the constant pressure of doing well at social, economical, academics and business sectors it is very natural for a person to feel insecure and nervous and anxious. But, when this feeling of anxiety or insecurity becomes a constant and nagging factor of one’s life, it can prove very dangerous. In this blog we will see the effect of anxiety on the human body. Constant anxiety can have an adverse effect on both physical level as well as mental level. A human body functions with the help of different systems like cardiovascular, respiratory, digestive, nervous, reproductive and lymphatic systems. Constant or intense anxiety or stress has an adverse effect on all the systems and organs associated with it. Anxiety can lead to increased heart rate, palpitations, increased blood pressure. All these changes take place in the body by more production of stress hormones like adrenalin, noradrenalin and cortisol. Breathing rate of the person increases. Lungs require more oxygen to function. Anxiety and stress has a direct adverse effect on digestion. Weak or poor digestion is considered responsible for majority of the illnesses. When you are experiencing anxiety you may eat much more or very little than your daily intake of food. Acidity (gastritis) or heartburn becomes common when there a person becomes chronically anxious. One may experience nausea, vomiting, and a ‘butterfly’ like sensation in stomach. Chronic anxiety may lead to ulcers in the stomach or one may develop irritable bowel syndrome (IBS). Person may complain of recurrent diarrhea or constipation. Anxiety and stress stimulates the production of Catacholamines commonly known as epinephrine, norepinephrine and dopamine. These chemicals have adverse effect on memory, both long term memory and short term memory of the person is affected. Person becomes forgetful and irritable. He can experience lack of concentration, feeling of fear and decreased sleep or disturbed sleep pattern. 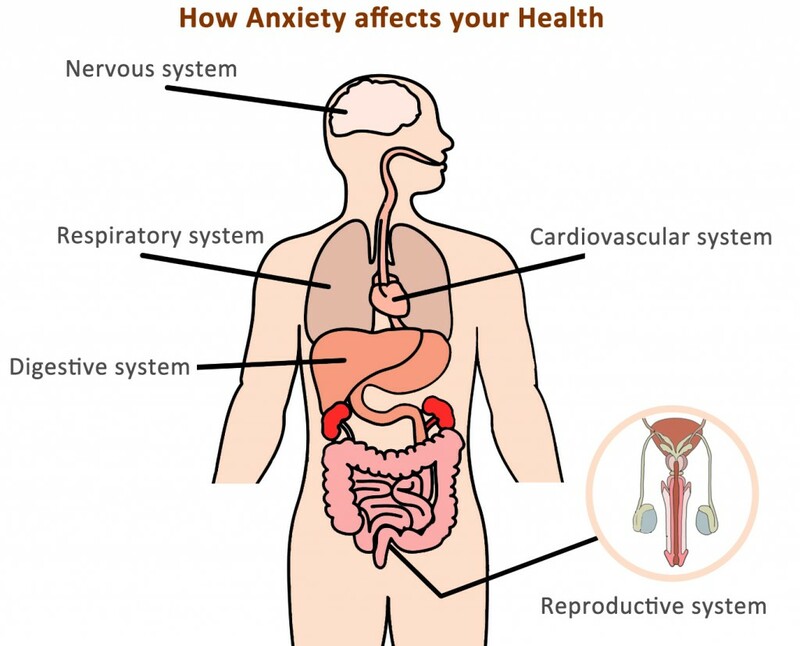 The reproductive system in both males and females are adversely affected by constant anxiety. Females can experience disturbance in menstrual cycle. Long term anxiety or stress can lead to absent or delayed menstruation with severe pain and excessive bleeding. Women can experience increased intensity of Premenstrual Syndrome (PMS). The symptoms like cramps in legs, fluid retention, mood swings and crying episodes worsen because of chronic anxiety. Women of child bearing age find it difficult to become pregnant in spite of normal functioning of reproductive system in both males and females. Women of menopausal age also get adversely affected. Symptoms like hot flashes, mood swings etc aggravate and the transition period becomes difficult. Stress or anxiety can affect the skin badly in terms of loss of glow, development of acne etc. Certain skin diseases like psoriasis, eczema and Vitiligo are known to appear because of anxiety. Hair fall is also very common in constantly anxious people. Stress can give rise to even baldness both in men and women. Prolonged anxiety could trigger under-active thyroid or hypothyroid, which in turn, could lead to many loss of hair, loss of glow on skin, and other symptoms. Thus, long term anxiety or stress has an adverse effect on entire human body making the life difficult. It also makes the person addicted to the use of tobacco, alcohol and other drugs.